Empower Women in Darfur Now! We have been chosen to be part of the Girl Fund Campaign with Global Giving. From now until Thursday 15th March you can help us make a real, and lasting, difference to women’s lives. If we get enough support we could be selected for one of six spots in the Girl Fund, securing project funding for the rest of 2018! Just think what that would mean in Darfur – but we only have these two weeks to do it. In order to do be chosen, we have to get the most donors to our Project titled ‘Empowering Women to Earn an Income- Darfur, Sudan’ on Global Giving’s website here. It is 100% up to YOU to help us secure funding! A donation as small as £10/$10 will make a huge difference. It is not the amount we raise, it is the number of different people who donate- so please will you ask your friends to join us? We need you to ‘Vote with your Donation’. Your help will enable us to empower some of the most deprived women in the world to build better futures for themselves and their children. Thank you! 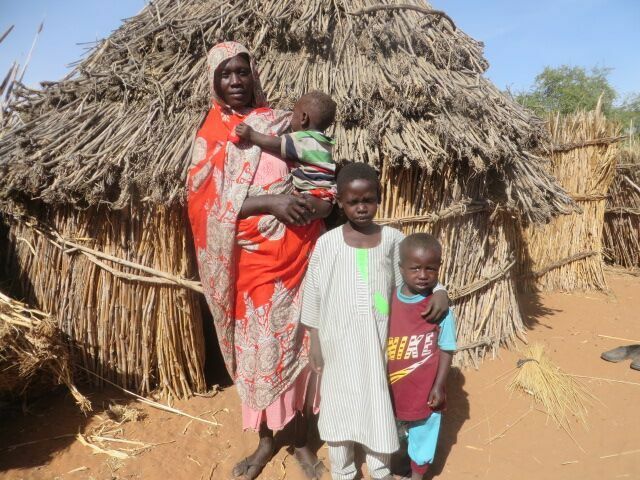 Women are left alone in appalling conditions in Darfur while their husbands leave in search of work. Without any form of income, women are not respected or treated as equals, they do not have a say on any village matters. Almost invariably village leaders are men. With no money, or household possessions, women have no power over their own lives. Children suffer because the family cannot afford to send them to school, so the cycle of poverty continues. An income that belongs to the women changes this dynamic in Darfur, because it gives women the freedom of choice and ability to make decisions for their families for the first time ever. Our Goat Loans are designed to empower mothers. They can choose to sell milk, yogurt, and male kids. At the end of the two years of the loan, when they pass on six kids to another of the poorest women in the village – empowering her too – the flock is theirs to do with as they wish. And of course the wonderful thing is that mothers will choose to spend on their children – helping the next generation in their turn. One of our priorities is to train women as Midwives, First Aid Workers and Paravets giving them an income, but also a higher status in their village. Even owning a blanket changes their status, they are so poor. Our Village Animal Loan Committees have more women than men, ensuring women’s voices are heard. We train the poorest members of the village to run village committees and make crucial decisions for their communities. This brings a huge positive transformation to the village, and because our projects are sustainable, more women benefit over time. Giving a woman the tools and resources to earn an income and change her life will change the lives of future generations and end the poverty cycle. Each year we adopt yet more villages, empowering more and more women because everything we do is sustainable.